Patent examiners have a fascinating history. In the 19th century, they were celebrities! 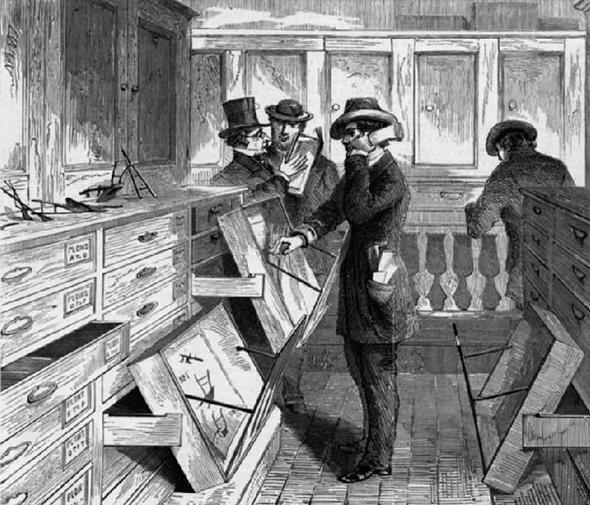 This illustraion published in Harper’s Weekly in July 1869 shows patent examiners at work. I once silenced a seatmate on a transatlantic flight who threatened to be overly chatty by (truthfully) telling him that I was traveling to London to speak about the history of the patent examiner. Horrified I might tell him about it, he quickly returned to his own, apparently more interesting reading. One glance at the Manual of Patent Examining Procedure, a government publication more than 3,000 pages long, would seem to justify his suspicion that patent examination is dry as dust. The manual, familiarly known as the MPEP, provides instructions to the employees who review patent applications as well as guidance to inventors seeking patents. The MPEP is dull reading. Its dullness, however, hides the nearly magical task of the patent examiner. It also papers over decades of lively controversy about how patent examination should occur, if at all. Application review in patent-speak is “examination,” and those who conduct it are “examiners.” Examination is the chief task of the patent division of the U.S. Patent and Trademark Office, which currently employs about 8,000 patent examiners. Examiners decide which ideas are useful, new, and clever enough to be patentable. If a patent application is granted, the idea becomes intellectual property. It is no longer freely available to anyone who happens to think of it but is the exclusive property of the patent owner, at least for a period of time (currently 20 years from the application filing date). Since 1790, the dream of American inventors has been that the patent system will spin the rough straw of their ideas into gold. The first U.S. Congress began the federal patent system but saw no need for a patent office. The Patent Act of 1790 required the secretary of state, the secretary of war, and the attorney general to consider each application. (If this act were still in force, John Kerry, Chuck Hagel, and Eric Holder would have read more than 500,000 applications in 2013). These men decided whether each invention was new and also “sufficiently useful and important” to justify the gold of an exclusive grant. Thomas Jefferson is sometimes called the first patent examiner because Jefferson, then secretary of state and an inventor himself, took a leading role in considering patent applications. As described by Jefferson biographer Dumas Malone, in March 1791, Jefferson set aside his worries about relations with Europe in order to welcome scientific luminaries to his office. The men gathered to watch Jacob Isaacs demonstrate his device to turn seawater into fresh water. The device did not work, and Isaacs, like more than two-thirds of those whose applications were considered by this elite group, did not receive a patent. It soon became apparent that the secretary of state lacked sufficient time to consider patent applications. With Jefferson’s encouragement, Congress revamped the patent system in 1793, making it more like the British system, although according to Edward Walterscheid, about one-fifth the cost, even factoring in the need to prepare drawings and models. Any inventors who filed the necessary paperwork with the State Department, swore their invention was new, and paid $30 could receive a patent. Applications were simply registered rather than examined. For the next 40 years, getting a U.S. patent was quick and cheap. The catch was that despite the inventor’s oath, many issued patents did not describe a new and useful idea, either through ignorance or fraud, and were therefore invalid. The only way to identify valid patents was a court case. Examination by litigation was time-consuming and expensive. The examiner was inserted into the patent system to chart a middle ground between granting patents only to those able to satisfy the secretary of state that an invention was sufficiently important and handing them out to all comers. In 1836, Sen. John Ruggles of Maine, an inventor who visited the State Department to learn about patent applications soon after he arrived in Washington, D.C., sponsored an act that created a patent office and the position of examiner. The examiner, relying on his knowledge and the patent office library, would consider whether each invention was new, useful, and more than just an obvious improvement over existing inventions. Charles Keller, whose long career working with patent applications before the new law passed is described by historian Kenneth Dobyns, was appointed the first full-time patent examiner, and granted Ruggles patent No. 1 for a steam engine. From the outset, considering each invention against the prior sum of knowledge to decide what is truly new and not obvious was virtually impossible. Ruggles envisioned that examiners would have “a general knowledge of the arts, manufactures, and the mechanisms used in every branch of business” as well as of the scientific and technical principles behind each existing U.S. and European patent. By 1836, there were already about 40,000 patents. Keller, a self-educated man, had gotten the job due to his experience with the old system. As Congress gradually authorized more examiners to deal with the ever-growing volume of applications, examiner jobs were hotly sought after by the scientific elite. There were not many men (and almost no women) with scientific training in the early-19th-century United States, but there were even fewer scientific positions. Noted antebellum scientists, like Charles Grafton Page, a chemist and expert in electromagnetism, and Titian Ramsay Peale, a naturalist, were grateful to find well-paid work as examiners. Page, Peale, and their colleagues quickly found themselves in the hot seat. Their job was to avoid issuing invalid patents, and in the 1840s, they were rejecting more than 50 percent of applications. Rejection made inventors unhappy. Many were unwilling to believe that their idea, while new to them, was not new, or was too obvious. Examiners received the blame. As historian Robert C. Post has noted, Scientific American and the New York Times fulminated against “conceited, crabbed, mulish” examiners who denied the hardworking inventor the anticipated gold from his idea. Rejected would-be patentees argued that these “scientific men” relied on “what they have read in books” and lacked practical experience. One examiner in 1850 was nicknamed “the guillotine,” having seemingly never met an application he could not reject. Inventors who closely watched applications saw the process as unpredictable and unfair—they thought that it depended on the state of mind of the four examiners, which seemed to shift from week to week. In 1850, Scientific American called for one of the four—W.P.N. Fitzgerald, who trained both as a lawyer and in mathematics and natural philosophy at West Point—to be fired. The publication said that it would prefer a “simple headed” man to one who had no common feeling with inventors. In 1852, Fitzgerald and three other examiners, all under attack in the press, resigned. For the next century, patent officials sought to make examination less impossible and controversial by adjusting hiring procedures and rejection rates. In the 1850s, Secretary of the Interior Robert McClelland, who held authority over the patent office, pushed a solution that neatly fit his own goals. In place of the best-trained scientific minds as examiners, he sought to hire political supporters, a common and legal approach in the 19th-century civil service. By the end of the decade, these less-scientific examiners were granting two-thirds of applications. The patent commissioner in 1858 urged examiners to welcome “the inventor as a friend” and fired those who were too “unsympathizing” when considering applications. Patent commissioners resented political meddling in their hiring and used a different approach to hire examiners who would spark less inventor resentment yet have relevant skills. In 1869 the patent office became one of the first federal offices to use written examinations to screen potential hires, seeking to replace reliance on elite credentials and scientific reputation with standardized proof of “general knowledge.” These hires rejected a little more than one-quarter of patent applications, and the commissioner boasted that Americans were saved from the inefficiency of “worthless patents,” and could instead invest thousands of dollars “with scarcely a reading” of a patent, knowing it to be valid. The New York Times, too, now praised patent examination as the chief virtue of the U.S. system. *Correction, May 9, 2014: This article originally misstated that the Manual of Patent Examining Procedure was published in 1945. It was published in 1949.